So I’ve been a long time fan of Beyoncé. Ever since she was in Destiny’s Child. I was listening to a Beyoncé playlist on Spotify while driving home the other night and there are seriously so many songs that she has done over the course of her career that there is no way I could pick a favorite. Or even a top five for that matter. I was thinking about her videos and started pondering which ones would be on my all time top ten list. I would like to share my ten most favorite music videos of Beyonce’s. Not necessarily because of the song alone, but that combined with the visual appeal. Please feel free to share and comment which is your favorite Beyoncé song or video. 1. Get Me Bodied-This is one of my all time favorite feel good songs. Not just from Beyoncé but in general. This song always makes me feel good and I find it hard to sit still when I hear it. I absolutely loved the video when it first came out and loved that she had the former D.C. members and her sister, Solange, featured in it. Who can resist dancing when you hear Bey naming those classic dances? 2. Ring the Alarm- This is a personal favorite for me because what woman can say that they haven’t been in a relationship or came out of a relationship where they felt cheated? Like you gave your all just for him to move on to someone new. We all have a little bit of crazy in us (some more than others) and this definitely expresses what a lot of women have felt. 4. Crazy In Love-This was the first video Beyoncé made during her solo career after Destinys Child. She is not done up but still looks beautiful. She gave us the “uh oh” dance and her legs are giving me life in those shorts. This was the first song her and Jay didntogether after “03 Bonnie and Clyde” and they had a definite chemistry. 5. If I Were a Boy-how many times do we say that men would never be able to handle it if we did to them what they do to us all the time? Every lyric in this song is relatable to women and shows the many double standards that exist in relationships. I love the twist at the end where she is the one doing dirty and he uses the “how do you think that makes me feel?” Line on her. 7. Hold Up-I think I like this song so much because it is an updated version of Ring the Alarm and anything that’s a little crazy appeals to me. I love her yellow dress and her willingness to admit that even Bey gets insecure and jealous. “What’s worse? Looking jealous or crazy. More like being walked all over lately, I’d rather be crazy”. 8. Single Ladies- this is another feel good song and I would be lying if I didn’t say that I didn’t memorize the choreographed dance routine in this video. It was mocked on multiple forums and the best was Justin Timberlakes rendition of the famous video on Saturday Night Live. This song is played at every party and wedding reception and woman love doing the wrist twist. 9. Run The World- This video is very visually appealing to me and Beyoncé said she received inspiration for this video by the different dances and cultures she saw when she took time off to travel. “Boy you know you love it how we smart enough to make these millions. Strong enough to bear the children. Then get back to business”. 10. Irreplaceable-this song gave us the famous “to the left” line. “To the left to the left. Everything you own in a box to the left”. A message to all that you are NOT irreplaceable. I think most woman can say they have sung this song after a breakup or when in the end stages of a failed relationship. The other night, my son and I fed crickets to our baby bearded dragon, Spike. The following day, Spike was not himself. He hadn’t eaten all of the crickets that I put in his tank the night before and I made the mistake of leaving the remaining crickets in there overnight, thinking he would eat them the next day. The next morning, the crickets had taken over his tank and were hanging out on his vine and Spike looked distraught. He was laying flat and his little hands were trembling. We killed the crickets and took Spike out. He started shaking in a seizure like manner. 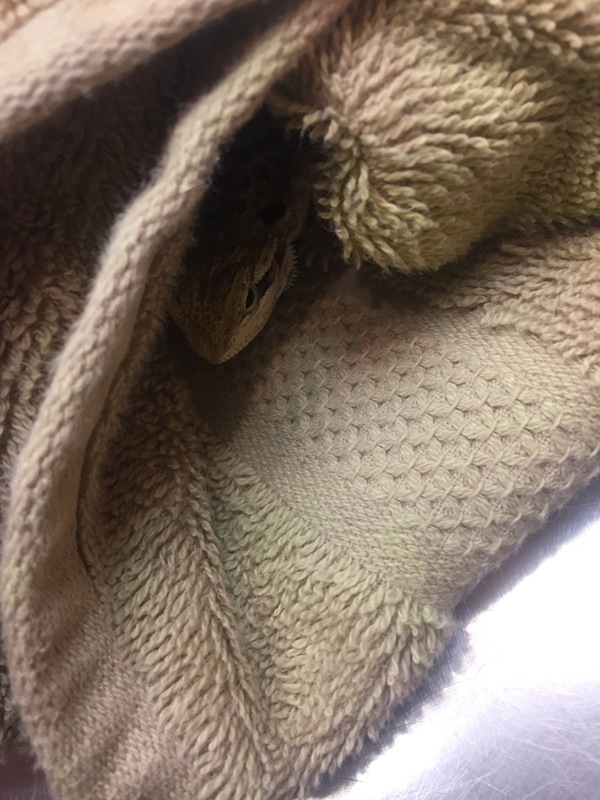 My mom wrapped him in a little hand towel and we called vets in our area and finally found one that deals with exotic animals. We brought him to the clinic immediately and found out that he was having a calcium deficiency seizure. The vet asked if we had a light in the tank. I told him that we had a heat lamp. I didn’t know that you needed a UVB lamp in addition to the heat lamp. The UVB lamp is what helps the reptiles to produce Vitamin D which in turn breaks down the calcium. The vet gave Spike a calcium injection and dewormed him in case he had any parasites. He gave us a calcium medication to give two times a day. He also gave him an enema becauae there was a chance that he was impacted due to not being able to break down the food. The vet was great and gave us a lot of helpful tips that the person who sold him to me didn’t tell me. Spike came home that night and did not want to be put down. He wanted to be warm in the towel and held. Two days later, Spike is now much better. He’s still a bit tired and wants to be held, but he is moving around and getting his calcium medication. We bought a cricket holder and put dry dog food in there and a sliced grape. Usually I buy him single serving of crickets and feed him that. The vet said to put the crickets in a case with food so that they load up with nutrients, this way when spike eats them he will get more nutrients. I also purchased the UVB lamp and calcium powder. I did not know that you have to put the powder ok the crickets before feeding. I bought some kale and put that in his tank as well sprinkled with some vitamins as he doesn’t take to the collars greens. Thank you to the vet who squeezed us in at the end of the night even though he was booked and thank you to the veterinarian receptionist who called the next day to check on Spike. My son is ecstatic that his pet is better and I’m so proud of him as well for how concerned he was about Spike. He constantly checks on him and let’s me know it’s time to give his medicine. 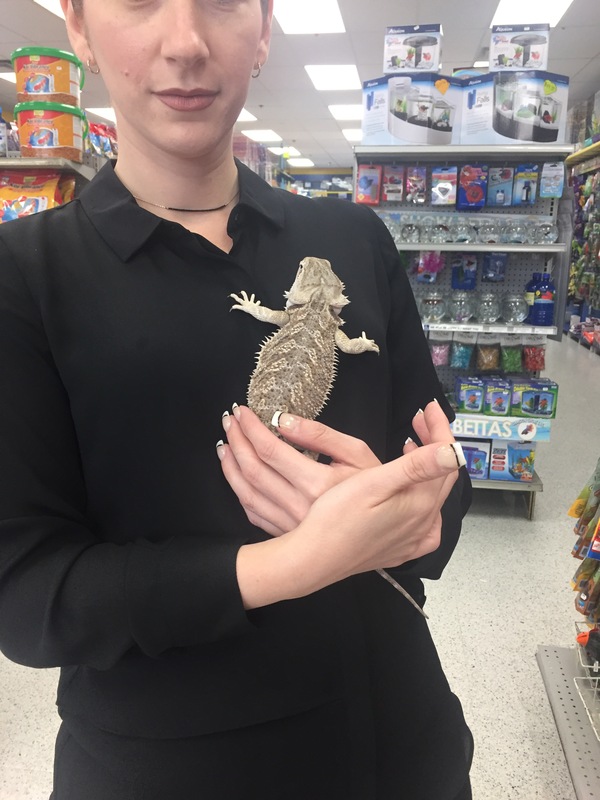 This is a bearded dragon that we held in the pet store when we went to buy Spike the additional items he needed. He’s really cute and friendly and I can’t wait to see Spike when he is this big. I honestly love all genres of music, but R and B is my favorite without a doubt. Maybe it’s because I’m a hopeless romantic that these tunes seem to touch me the most. Whether I’m in love, have a crush or am heartbroken, there is an R and B song that knows exactly how I feel. I remember falling asleep while listening to the Quiet Storm every night in high school. Today’s R and B will never compare to the talent that we had back when I was growing up. Only in the 90’s would a group of guys dressed in baggy jeans and Timbs belt out a love song while dancing in the rain. I wanted to share some of my favorite old school R and B videos with you. I hope you enjoy and please feel free to share your favorites with me as well. Dating as a single mom is not easy. The biggest problem that I have faced is finding the time to actually go out on dates. When you don’t have a child, you can up and go as you please. You don’t have to worry about finding childcare. For me personally, my son goes to his father every other weekend. So I do have those weekends free, but most people don’t want to hear that you can only see them every other weekend. It’s very difficult to really get to know someone and form that bond when you are not spending time together in between. I am not able to get together after work because I have to pick up my son, do homework and everything else that is part of the daily after work routine. Most days, it’s hard to even find time to devote to a live phone conversation. Between cooking dinner, running errands, homework and bed prep there really is no time to talk. By the time my son is asleep I barely have any energy left. Text messaging is a god sent for these reasons but it’s nice to have that real conversation sometimes, to hear the other person’s laugh and tone of voice. Many people are not understanding when you say that you can’t call until 10 pm when everything is calm and settled. I’ve had people that caught an attitude if I took long to respond to text because I was in the middle of dinner or helping with homework. When I say that I can’t go out every weekend, that is also an issue. Someone once told me that they are worried about getting involved because what will happen when they miss me and want to see me during the week? It’s a struggle because I don’t want to introduce my son to anyone too early on so I can’t even offer the option of stopping by to see me and then even after some time does pass, many men seem to be wary of doing anything that involves incorporating my son into. I’ve only found one person that actually invited my son to come along. Otherwise, I have not had that luck. One man told me that a lot of men are hesitant when it comes to dating someone with a child because they think that means they will be obligated to take care of the child or to step in line as a second father. I am not looking for a replacement father as he already has one. I am not looking for someone to chip in financially for my sons needs. Dating a single mom takes someone who is patient and understanding. Someone who understands that while you are not expected to play step daddy, that child is part of the package and will at some point have to be incorporated into things. 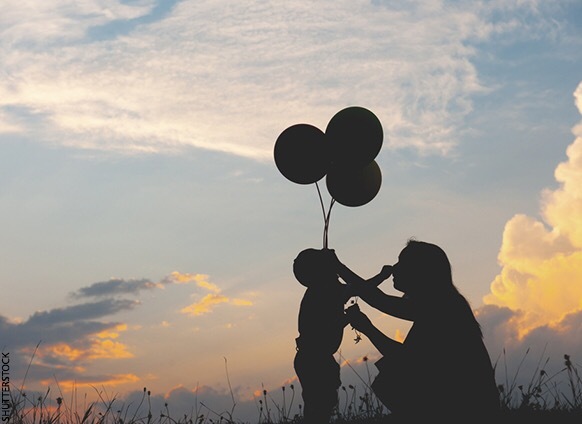 I’ve found that men with a child are a little bit more understanding of things, however, unless they have custody, they still don’t grasp the whole lack of time dilemma as they do not have their child for most of the week. Men with a child do seem to be a bit more interested as well when it comes to you talking about your child. Men that I’ve dated without a child seem to be lost when I talk about my son or something he did that I thought was cute or made me proud. Men with children appreciate and can relate to those feelings and experiences that you are referring to more. I’ve seen women with a child, sometimes more than one, that have found happiness and love with a man who is not the father. Some of them have remarried or moved on together and it makes me wonder how they got to that point as I struggle with even maintaining a consistent dating routine with one person. So to anyone facing the same situation, I say this. One day, the right man will come along. He will understand that a little patience, effort and consistency will all be worth it in the end. He will appreciate the sacrifices made by a single mother. Sometimes the hardest part of letting go is accepting the fact that the other person is never going to change. The reason that’s so hard to do is because when the other person doesn’t change, that can cause feelings of doubt about your worth and it makes you realize that this person does not care enough to save the relationship. When you really love or care about somebody and want it to work, you will change the actions that are causing the other person pain. Nobody or nothing will get in between you and the person you love. If the other person continues to talk to other girls (or guys), comment on other girls (guys)pictures, lie to you, cheat, etc. after you have already asked them to stop, then that person does not really love you. I had someone that would not leave other girls alone, whether it be contacting them on social media or talking to them on the phone. It caused many fights yet he continued to do it. So you know what? He didn’t really love me or care about me enough to stop doing it. If he did, that would have never been an issue after the first time it happened. There is nothing worse than having someone that does not fight to keep you. Someone that is not proud to say you are theirs. Someone who does not view your happiness as a priority. Someone who makes you feel like everyone else is more important to them than you. Some people need to have their egos stroked. Some people aren’t satisfied with attention from just one person. Some people feel that they are not good enough for their partner or are inadequate compared to their partner, therefore, they make themselves feel better by getting attention elsewhere to lift their shattered self esteem. Do not ever accept this type of behavior, whether you are man or woman. 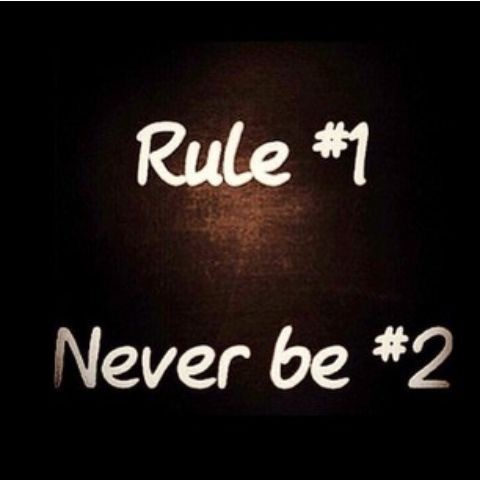 You deserve to be not just number one, but the ONLY one. You should never have to compete for the attention of the person you are with and you should never be made to feel that you are just one of many options. I am not your option. I am your priority. If you cannot do that and maintain that standard, then you have no place in my life.